Carabiners are a perfect accessory for any mobile or flash product. Their versatility allows for an endless amount of uses. 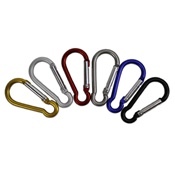 Choose from our colorful selection of metallic carabiners.